Protest against the "imposition" of PRI presidential candidate Enrique Peña Nieto, July 2012. Photo from #YoSoy132. July 29, 2012 -- New Politics, posted at Links International Journal of Socialist Renewal with permission -- Mexico's presidential election that took place on July 2 is over—but it is not done. Tens of thousands of Mexicans have been marching every week for almost a month in Mexico City and other cities throughout the country against what they call the “imposition” by Mexican election authorities of Enrique Peña Nieto of the Institutional Revolutionary Party (PRI) as president of Mexico. July 8, 2012 -- New Politics -- Carrying signs denouncing fraud, tens of thousands of students and other voters marched through Mexico City on July 7 to protest what they see as the government’s imposition on the country of presidential candidate Enrique Peña Nieto of the Institutional Revolutionary Party (PRI). Peña Nieto received 38 per cent of the vote, compared to 32 per cent for Andrés Manuel López Obrador of the left-of-centre Party of the Democratic Revolution (PRD), and 25 per cent for Josefina Vázquez Mota of the conservative National Action Party (PAN). López Obador claims that the election was fraudulent and has called upon the election authorities to investigate claims of vote buying. Students, however, have led the protests. In addition to the mass march in Mexico City, they also marched in smaller numbers in several other major Mexican cities, including an impressive demonstration by an estimated 7000 in Guadalajara on July 6. 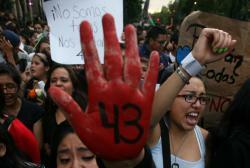 The protest was organised largely through social media by the “I am #132” movement which has dogged Peña Nieto for two months, criticising in particular his close ties to the powerful Televisa television network. "The Zapatistas’ anarchist strategic outlook, with their anti-theory 'no political line' position and their disdainful 'all politics is corrupt' led them to abstain from key struggles against neoliberalism." January 12, 2011 -- Links International Journal of Socialist Renewal -- This is an examination of Mexico’s social movements, the political parties’ and organisations that lead them, and their tactical and strategic outlooks, as well as the left’s successes and failures in the fight against neoliberalism. From 1994 onwards, the Zapatista National Liberation Army (EZLN) and the centre-left electoral formation, the Party of the Democratic Revolution (PRD), have been the organisations that have led the largest social movements in Mexico. Hence, the effectiveness of their strategies -- Zapatista anarchism and Party of the Democratic Revolution electoralism -- in resisting neoliberalism in Mexico will be examined. Patria Jiménez. Photo by Rachel Evans. May 21, 2009 -- Coyacan, Mexico -- I interviewed Patria Jiménez in Coyacan’s normally bustling markets. The onset of the swine flu crisis had emptied the streets and enforced a stiffness into Mexico’s normally effusive greetings tradition. No kissing hello or shaking hands was encouraged. Jiménez ignored swine-flu protocol and greeted me warmly. In 1997, Jiménez made history by being elected the first openly lesbian member of Mexico's Chamber of Deputies. 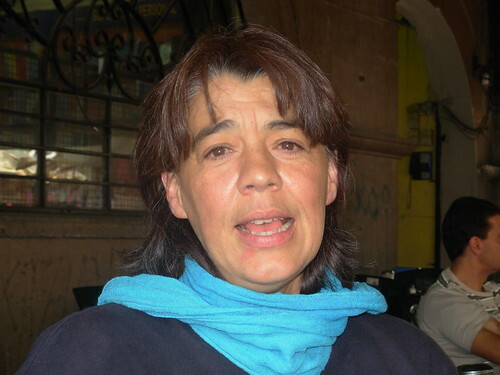 Representing an alliance that included the the Workers Revolutionary Party (PRT) and the Party of the Democratic Revolution (PRD), Jiménez was also the first openly lesbian candidate to be elected in Latin America. She is standing again within a coalition, Salvemos a México (We Will Save Mexico), for the July 2009 federal elections. Peter Gellert. Photo by Rachel Evans. 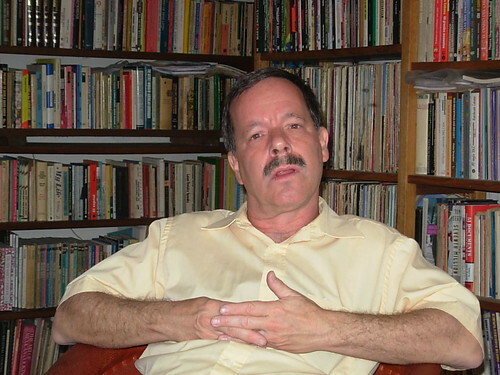 Peter Gellert is a US-born, long-term activist, now Mexican citizen. He is a leader of Mexico's Movement for Cuban Solidarity. Links International Joural of Socialist Renewal’s Rachel Evans spoke to Gellert in Mexico City. February 18, 2009 -- Inside Peter Gellert´s small apartment books of history, politics and art, line groaning walls. Meticulously framed Cuban posters monopolise the remaining space. Three turtles climb over each other in a fish tank that gurgles sporadically. The Zapatistas: a left turn? The left in Mexico is a huge and incredibly diverse phenomenon and one which is potentially extremely powerful. It encompasses tens of thousands of tenacious, devoted and often very brave men and women, fighting against a state which, despite the democratic space created in the past 20 years, still routinely responds to its worker and peasant opponents with disappearances, assassinations, imprisonment and torture. Every critical point made here has to be seen against that background.